SketchUp is easy to use/learn 3D modeling and drawing tool, that let you create 3D models of anything you can imagine: houses, sheds, decks, home additions, woodworking projects - even space ships. You can add details, textures, and glass to your models, and design with dimensional accuracy. Google SketchUp is a great way to discover if 3D modeling is right for you. It's useful from the earliest stages of design to the end of construction. Programming, diagramming, design development, detailing, documentation, RFIs - wherever you need drawings, you need SketchUp. It can be used on its own or as Google Earth plug-in. Get hundreds of add-on tools built to solve the kind of modeling problems that might otherwise leave you scratching your head. SketchUp Make - free for educational and personal use and offer limited functionality. 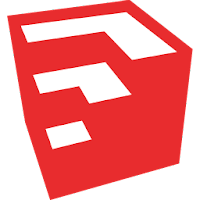 SketchUp Pro - full version with all features unlocked suitable for both personal and commercial use. Disclaimer: Direct downloads for the lastest version of SketchUp 2017 17.2.2555/16.1.1450 are provided by the official software's author, we can't guarantee safety, availability or download speed. Moreover, we don't and we won't provide any pirated/illegal versions or tools. We recommend you to avoid it as these methods can harm your device. If you like the software, buy it to support the developers. (We provide software discounts for many worldwide brands).